Take big bowl, grate potatoes and onion (on the star shaped grater), taking turns and mixing grated mixture. Onion juice will keep potatoes from browning. Add flour, egg, sour cream and mix it well, than add 1 tsp of salt and some black pepper, batter should be still liquid enough so you can easily ladle it. Warm up a skillet with 2-3 Tbsp of cooking oil over medium/high heat. Add 1 heaping Tbsp of mixture at a time to the skillet fry on one side until golden brown in color, then flip to other side and fry for the same amount of time. Repeat the same procedure for the rest of the batter. 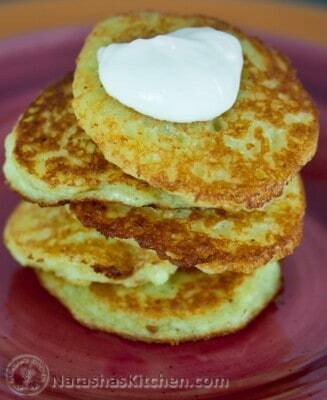 Serve deruny warm, they are best with sour cream, enjoy.